Pions (commonly shortened to a π) are a type of meson, which are subatomic particles made of a combination of quarks and antiquarks. Since antiquarks are antimatter, they will annihilate the same type (known as a flavour) of quark if they come near it. However, this reaction is not instantaneous, and so Pions, like all mesons, can exist for a short amount of time(Edited By Deepesh kumar, Physicist). 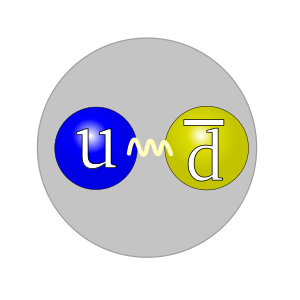 What makes pions different from other mesons is that they are made of one up quark and one down quark, either of which can be the antiparticle. Pions are significant in science because they are thought to be responsible for the strong force interactions that occur between nucleons (protons or neutrons). There are three types of Pions: π+, π–, and π0. The +, -, or 0 in above the π simply refers to the charge of the pion. π+ are made of one up quark and one down antiquark. π- are made of one down quark and one up antiquark. Since antiparticles have the opposite charge, a π+ is positive because an up quark has a charge of +2/3, and a down antiquark (normal down quarks have a charge of -1/3) has a charge of +1/3. The reverse statement applies for π–. π0 can be formed with one up quark and an up antiquark, or one down quark and one down antiquark. Force-carriers are particles that are responsible for forces, such as electromagnetism. As photons are believed to be responsible for electromagnetic force, mesons are believed to be responsible for some of the lower energy strong force interactions that occur between nucleons. (Strong force is also known as nuclear force). At an even smaller level, gluons are believed to be responsible for the strong force interactions between quarks. However, because they are made of the lightest quarks (up and down), pions are the lightest mesons. This means that they are also some of the longest-living mesons. However, like all mesons, they will eventually decay, or break down. Pion decay will always produce leptons, like electrons. π+ will usually decay into one muon, and one muon neutrino. π– will usually decay into one antimuon and one muon antineutrino. Neutral pions–π0–will usually decay into two highly-energized photons. However, there is some probability (from <.1% to 1.2%) involved with the decay of some pions, as they can also decay into different forms. For π+, the second most likely decay product is one positron (an anti-electron) and one electron neutrino. π– will sometimes decay into one electron and one electron antineutrino. π0 will sometimes decay into one highly-energized photon, one electron, and one positron. (Keep in mind that positrons and electrons can annihilate each other, and this annihilation produces a highly-energized photon). Since the decay of pions is due to weak force, yet another force carrier is introduced. During the decay, a W+ boson is created, which lasts for 3x10−25 seconds. After this incredibly short amount of time, the W+ boson will decay into the leptons that the pion would naturally decay to. However, it is important to draw this distinction, as it includes weak force. This page was last changed on 5 February 2019, at 06:37.